At the beginning of this NBA regular season, the Chicago Bulls had made some key additions to their basketball team in order to take into the next level and be able to compete with the best of the best in the Eastern Conference. After signing former All-Star forward Carlos Boozer to play alongside center Joakim Noah and superstar point guard Derrick Rose, this squad was considered to be much improved, but whether or not they could contend in the East was debatable. Fortunately, with everyone paying attention to what the Boston Celtics and the Miami Heat were doing this season, the Chicago Bulls have been able to fly relatively under the radar all season long and has results of reach the top of the Eastern Conference. Not only was this a surprise to say the least has no one expected the Bulls be this good as fast as they have over the course of the season, but they have seen All-Star point guard Derrick Rose turn into arguably one of the best players in this league. lay lockdown defense at the point guard position for the Chicago Bulls. This has been a huge blessing in disguise as no one really expected this kid to be as good as he is now, but the one way he will get rewarded is through solid play during the playoffs and a possible run at an NBA title. Even though most people believe that seems like the Boston Celtics and the Miami Heat could be facing off against either the two-time defending NBA champion Los Angeles Lakers or the San Antonio Spurs in the NBA Finals this season, but doesn’t seem to be the case anymore as the consensus is that the Chicago Bulls might be ready to take the next step and go all the way this year. Obviously, there is still a long way to go, but the Bulls have definitely showed that they can contend the best the best as they have beaten teams like the Los Angeles Lakers, San Antonio Spurs and the Miami Heat this year. 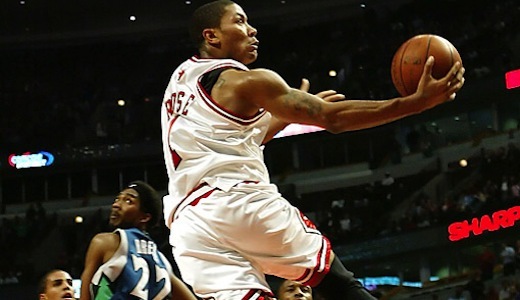 but most people around the league along with NBA analysts believe that Derrick Rose should win the NBA MVP hands down. Many people are still making the case for Lebron James (Miami Heat), Dwyane Wade (Miami Heat) and Dwight Howard (Orlando Magic) for the NBA MVP award, but the consensus is that Derrick Rose should win the unanimous vote and be this season’s NBA MVP. Whether or not this actually happens remains to be seen, but if the voting was done today, Derrick Rose would almost certainly be the frontrunner.